The NFL's oafish response to the Ray Rice elevator tape has led to a national outcry against the league's leadership and the culture it has allowed to fester. It was only a matter of time, really, before this became a PR nightmare for its many sponsors and partners. The latest? 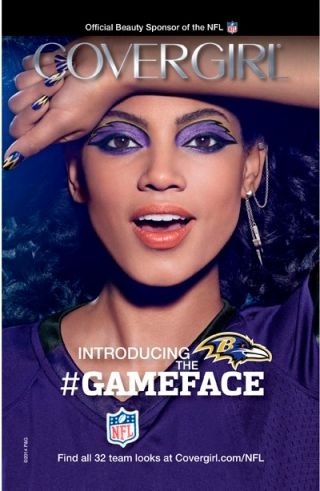 Cover Girl, the "official beauty partner" of the NFL. Last year, CoverGirl teamed up with the NFL to launch a line of nail art called "Fanicures." This year, they expanded that partnership by creating a series of "official team makeup looks," fantastical and bright colors applied inventively and advertised with the motto "Get Your Game Face On." The company pimped it on its Facebook page, on Instagram, on Twitter, and even made an entire board of NFL makeup looks on Pinterest. Every team.Including Ray Rice's team, the Baltimore Ravens. Fans excited about Girling the hell out while cheering on their team could find all of the looks on Cover Girl's special NFL Game Face website. Except today, that website is nowhere to be found. Is the page that overloaded with gawking makeup fans, or is Cover Girl rethinking its partnership with the NFL? The above image, taken from a Cover Girl ad and altered to be an anti-domestic violence message, went f*cking bananason Twitter this weekend. It's hard not to notice the unfortunate timing of a partnership between a makeup company and a sports league that has for years ignored its domestic violence problem. Makeup, after all, has been a long time go-to for survivors of domestic looking to cover up bruises and contusions. The image was paired with the hashtag #GoodellMustGo, a reference to the NFL's bumbling meathead of a commissioner, who fucked up so royally at every juncture in dealing with the Ray Rice case (and other domestic violence cases involving currently active NFL players who abused their wives off-camera). #GoodellMustGo was also emblazoned across large banners and flown over multiple NFL stadiumsyesterday. Still, as of four days ago, the campaign lurched on. I don't envy Cover Girl's marketing department today.